I meant to write this on the plane ride home this weekend (I have a 6000-word final paper due in 48 hours), but my thoughts are overflowing so it’ll have to be right now. I have an extraordinary dislike of the word “humbled”. I find it disingenuous when people say “I’m humbled by this incredible award I’ve been given” because it just sounds like they are finding excuses to toot their own horn. Which is why I don’t want to use it to describe all the feelings I’m feeling right now, but I do want to be very honest about those feelings. When I think about the fact that I’ve been named a 2016 Queen’s Young Leader for Sri Lanka because of an application I put together on laptops kindly lent by my roomies Keri and Naomi (mine had just gone bust) about a project that was funded by generous Princeton alums, buttressed by the volunteering, guidance, and monetary support of Princetonian, LC-ite and other friends, conducted in communities of people who were generous and forgiving of my foibles, that continues to exist because a few people (looking at you, Irfadha and Muradh) continue to work very hard on it, my first overwhelming feeling is one of (almost-unbelieving) gratitude. I have so many friends! I HAVE FRIENDS! I’m not sure I can adequately explain how big of a deal having friends is to me. In my application for the Queen’s Young Leaders Award, I told the story of how, as a child in Sydney, I dealt with playground racism and how theatre helped me overcome my insecurities, gave me confidence, and taught me empathy. It showed me how to walk a mile in someone else’s shoes, it taught me how to pivot and improvise, and it gave me some of my dearest friends. What I didn’t talk about is how from time to time I still mentally replay that scene from when I was a pre-schooler, of two girls and a boy taunting me as they always did about my dark colour, my oddness, my never-going-to-fit-in-ness, my never-going-to-have-friends-ness, and I sometimes let that get in the way of today’s reality. I forget that it’s no longer true. The reality that today, I can ask for help from any number of people stretching from Colombo, Sri Lanka, to Cambridge, Massachusetts, and they will all say yes. I’m luckier than I could possibly hope to be, and I’m luckier than those three children who didn’t have anyone to teach them any better. Sometimes, I forget this. Sometimes, I focus on myself and my worries and concerns and anxieties and forget that I should also be telling the stories of every single time I was shown how kind people can be. Of every person who’s taught me more about the kind of person I want to be, and not just the person that I don’t want to be. You’ve all shown me what it means to be human, and what it means to be a friend. A series of small, daily, generous actions, that often go unnoticed and unrecognised. Quiet and reassuring support. A message, short but timely, in times of need. Putting down the day’s task to just sit together, or to put out fires together. Showing up. Showing up again. And again. Which brings me to my next feeling: uncertainty and anxiety. “The word leader doesn’t sound right! I didn’t do Building Bridges alone! This needs some clarification!” And so on, and so forth. I don’t think the world needs more leaders, young or otherwise. I think it needs more community. This blog has always had a fairly anxious tone (“Do the kids like theatre? Am I imposing on the villages? Am I asking too much? Am I doing too little?”) and I suppose my uncertainty right now is about par for the course. But to harp on whether I deserve this or not is, in some ways, irrelevant. To be in the running for the Queen’s Young Leaders Award, you have to apply. I applied. So to be quite honest, if I was going to kick up such an almighty fuss about it I should jolly well have refrained from handing it in. So why did I apply, if I was going to feel like such an impostor when the awards were announced? I applied precisely for that reason. As a challenge to myself. You see, I applied for the award last year, but when it came to the Skype interview, I got cold feet. 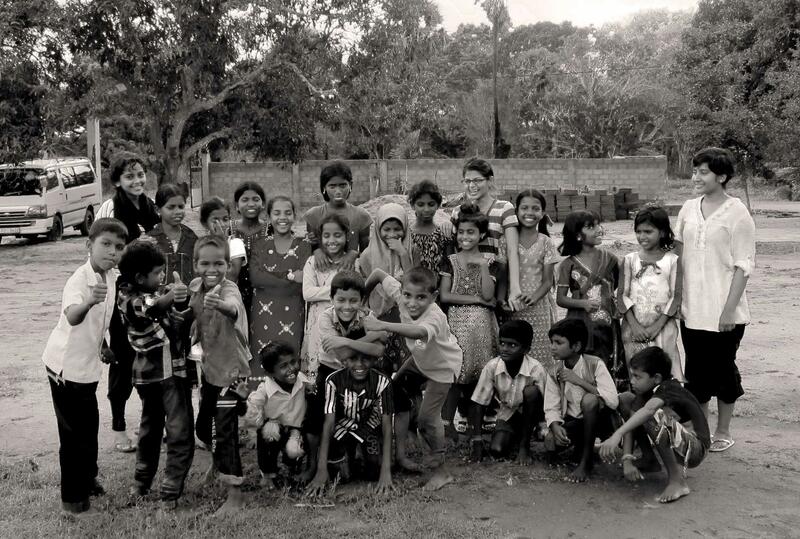 I convinced myself that this was an extraordinary act of hubris, to think I could consider myself a leader because I played charades with a bunch of children in Mullaitivu. It obviously sounds a bit preposterous when put like that, and so I stammered and stuttered my way through the whole call. Interestingly, while I didn’t get the award, I was named a runner-up, which gave me access to some of the resources prepared for the winners. This past year has been one of reflection about a lot of questions that I’d had, but never really gave time to. Like why I loved Building Bridges, but why I also loved academia, and whether those were irreconcilable parts of myself. The answer, I found, was fairly simple. I love learning, and I love teaching young people. I take particular delight in teaching young people how to learn. If I can give you a bunch of tools, then you have all the joy of figuring out the complex THING yourself. No one gives you a pre-made Lego set, but rote learning? Everyone does it. I think learning is far more magical than that, and that the creative arts in general (theatre, creative writing, poetry, art, design) are great ways to provide a toolbox for critical thinking, empathetic listening, and thoughtful dialogue. I think even the best engineers and scientists need the arts. I think everyone needs the arts. It makes me angry and sad to hear of young people in uni at home who demand their lecturers give them all their class notes. Don’t they know how much of a joy it is to discover? And occasionally to prove your professor wrong? And that if your professor is a real educator, that s/he should be excited about that possibility? The word leader gives me the heebie-jeebies, but the word educator? Hell yes. I want to do that with my life. But of course I see that “Queen’s Young Educator” is not particularly glamorous-sounding, and “Queen’s Young Human” sounds just plain odd. The QYL programme, I learned, provides teachings on things that I try to do with Building Bridges, and try to share in general — how to reach into yourself and pull out a story, and how to make meaning for yourself through the telling of this story. It teaches how to ask for help, and how to “write a cheeky letter” to people you look up to and whose guidance you could use. It even discusses how to interrogate impostor syndrome. So I applied again, to challenge myself not be paralysed by my mistakes. To not even call them mistakes. To consider them stepping stones to the next great iteration. And to share, share, share, everything I learned along the way, not too afraid to be wrong to take action. To be adventurous with my dreams to Building Bridges, to take risks and remember to take joy in the process of learning more about how to teach. I still feel like an impostor, you guys. I still feel like someone, somewhere, made a mistake in picking me. I’ll always be battling that fear. You know how, in Little Women, Jo struggles with her hot temper? That’s exactly how I feel about this. When loving and supportive friends write warm congratulatory messages, my first instinct is to say, “Thank you so much, but…” even though I know that it’s missing the point. I love you all for your outpourings. So that is how I am going to think about this — less an accolade, and more a challenge. Now that there will be more people aware of what Building Bridges does, it will be a challenge for me to wake up every day and be honest about my insecurities, but also to not stop there. A challenge to look at all the things I think weakest about Building Bridges (and about my work in general), and ask for help in making them better, instead of convincing myself that the whole thing was a terrible idea and give up. It’s easy to give up. If there’s one thing being an architecture student has taught me, it is the fact that initial ideas are fairly terrible. How do they become better? Through testing and constant iteration. My academic training is fairly excellent at teaching me how to spot egregious flaws, lazy thinking, iffy conclusions, and the like, but it doesn’t expect me to think up a solution that will be equally subjected to scrutiny and criticism. That requires a resilience and courage that I want to, more than anything, work at cultivating. So friends, I need you now more than ever. Meeting the Queen will be the easy bit. What I’m really terrified about is putting myself out there, about being in the service of my island while also being articulate about everything about her I’d like to see change. Challenge me, support me, and occasionally berate me for overthinking. And remind me, as you always do, what it means to be human. Nushelle! (Which my phone just tried to autocorrect to nutshell….er…). This is such wonderful news. Congrats! Cheering you on from NM. Nushelle! (Which my phone just tried to autocorrect to nutshells…er…). Congrats! This is such wonderful news. Cheering you on from New Mexico!